If you are looking for a trustworthy company that installs superior sunrooms in the Pasadena, Maryland, area, you can end your search with Allmaster Home Services. Since 1987, we have provided homeowners throughout the region with top-quality home improvement products that are built to stand the test of time. Plus, as a family-owned and -operated business, we have built our reputation around the exceptional customer service we offer. We won’t leave your home until you are completely satisfied with the work we have done, and we will communicate with you through every step of your sunroom project to ensure all of your requirements are being met. Our beautiful sunrooms can offer you year-round enjoyment of your outdoor living space at a fraction of the cost of a traditional room addition. Plus, your new structure will be backed by an industry-leading 50-year manufacturer’s warranty, so you can rest easy knowing that your investment will be protected for years to come. 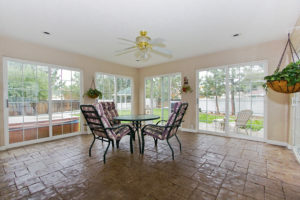 To learn more about the impressive selection of sunrooms we have available for homes in and around Pasadena, MD, contact Allmaster Home Services today.